Ringing in the new year caught me in my new sweater, tags and all. We took time out from our New Years Eve snacks to pose for this picture. Getting my secra-beary back on task has been exhausting work. Playing catch-up on blog posts next to impossible. So, I'm going to share my Christmas for starters. By Christmas Eve my mail had really piled up. My secra-beary / photographer was too busy. We usually celebrate Christmas morning. Since grandma wanted to have us over for brunch instead of doing a big dinner, we had our Christmas on Christmas Eve. So dad made sure our luminaries were lit. They were still burning Christmas morning when we left to go to my grandparents for breakfast. This is my grandma and grandpa's A. 's Nativity. While waiting for breakfast, I introduced my new friend French speaking Mickey to my grandma C. She spent Christmas day with us. My brother T. brought Mickey for us from his recent travels to France. My grandma thought he was asking if there would be cheese for breakfast. I told grandma I thought he was asking if we'd seen Captain Hook. He's dressed like Peter Pan, he's one confused mouse. First to arrive was from Jerry and Ben, they live in South Dakota. What a great photo card guys. 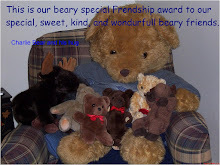 Second to arrive was a card from Sandy Bear who lives in Canada. He made a photo card too. The third card to arrive was from Beanie, he lives in England. Very cool, it looks like Beanie and his mum printed their cards from a linoleum block stamp they made. to draw a lovely Christmas pawtrait of me! I love it and my mom says she will look for a frame so we can hang it up every Christmas. Thank-you everybody for all the special Christmas cards you sent. 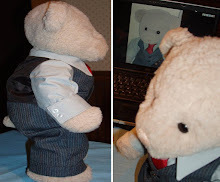 I hope everyone had a beary Merry Christmas and a beary Blessed and Happy New Year in 2013. Looks like you had a wonderful Christmas Buttons! Your tree is beautiful! Glad you enjoyed the card. Hope you have a great 2013! Love your sweaters!! Even the one with the tag still on! Looks like you had a wonderful Christmas. Perhaps French-speaking Mickey is having trouble with the language barrier? Have a great 2013!